Helen Schlie, an 88-year-old woman, and member of The Church of Jesus Christ of Latter-day Saints (also known as the “Mormon Church” by friends of other faiths), had a rare book, worth $100,000, stolen from her bookshop in Mesa, Arizona, this last month. What was the book? And why was it so valuable? Ancient prophets inscribed inspired words onto gold alloy plates, and the Prophet Joseph Smith translated the record hundreds of years later through the power of God into what is now known as the Book o Mormon—and this is just the book that Schlie had in her little shop. Schlie’s copy however, was no ordinary Book of Mormon that you can find at the local LDS Distribution Center; her book was an 1830 first-edition. In Mormon history there was a lot of persecution of the Latter-day Saints concerning this record, and there were many who tried to stop the work of printing the book entirely. Did they succeed in their quest? Of course not. This was the work of God, and He provides a way for his servants to accomplish the tasks that He asks of them (1 Nephi 3:7). Joseph Smith knew that this work must go forward, and despite the persecution, the Mormons were able to print 5,000 copies of the book in 1830—a large number for this time period. No one knows for sure how many first-edition copies of the book are still around, but because of the rarity of the sacred text, there are collectors who are willing to pay “the big bucks” for a copy. Schlie’s copy was a treasure to her; but she valued it at more than just a dollar amount—it was a book that allowed her to share her testimony of the Church of Jesus Christ with people all around the world. In fact, Schlie was able to get 50 pages taken from this book, mounted, framed, then sold for thousands of dollars each page, in order to help volunteer Mormon missionaries pay for their missions. Many would come to Schlie’s shop from all around the world just to touch this sacred book from Mormon history and even take pictures with it. A volume of holy scripture comparable to the Bible. It is a record of God’s dealings with the ancient inhabitants of the Americas and contains the fulness of the everlasting gospel… The crowning event recorded in the Book of Mormon is the personal ministry of the Lord Jesus Christ among the Nephites soon after his resurrection. It puts forth the doctrines of the gospel, outlines the plan of salvation, and tells men what they must do to gain peace in this life and eternal salvation in the life to come. And join them one to another into one stick; and they shall become one in thine hand. And when the children of thy people shall speak unto thee, saying, Wilt thou not shew us what thou meanest by these? The Book of Mormon is the word of God. Like Helen Schlie, I know that the Book of Mormon, whether a first-edition copy or one that was just printed in 2012, is priceless. I am so grateful that I can hold the stick of Judah (the Bible) and the stick of Joseph (the Book of Mormon) literally in one hand. Both of the records testify of the Lord Jesus Christ, and by reading and pondering over their words, I draw near to Him. 11 June 1829 Copyright for the Book of Mormon was obtained. 1 July 1829 Translation of the Book of Mormon was completed. July 1829 Oliver Cowdery began making the printer’s manuscript of the Book of Mormon. 17 August 1829 Joseph Smith and Martin Harris contracted with Egbert Grandin to publish five thousand copies of the Book of Mormon. August 1829 Oliver Cowdery delivered the first pages of manuscript to the printer. Typesetting commenced and the first uncut sheets came off the press. Stephen Harding was given the first title page. 25 August 1829 Martin Harris mortgaged his farm for three thousand dollars to pay for the printing. 2 January 1830 Abner Cole illegally published extracts of the Book of Mormon in his Reflector newspaper. January 1830 Grandin stopped printing because of a threatened boycott of the Book of Mormon. Joseph returned to Palmyra from Harmony to deal with Cole and to convince Grandin to complete the printing. 26 March 1830 Wayne Sentinel advertised that the Book of Mormon was for sale. 2011 The 150 millionth copy of the Book of Mormon was printed. 2011 The Book of Mormon has been fully translated into 82 languages and partially translated in 25 more. 2011 A full-time missionary force of more than 55,000 helps distribute free copies of the Book of Mormon worldwide. 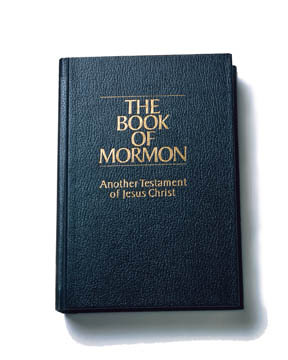 Since the publishing of this article, the following update has been released: The rare, first-edition copy of the Book of Mormon which was stolen was recovered in the Washington D.C. area on Tuesday, 12 June 2012, and the suspected thief, Jay Lindford, a close friend of the bookstore owner, has been arrested. He has been jailed in lieu of $40, 000 bond and faces extradition to Arizona. You can read the rest of the story by following this link.